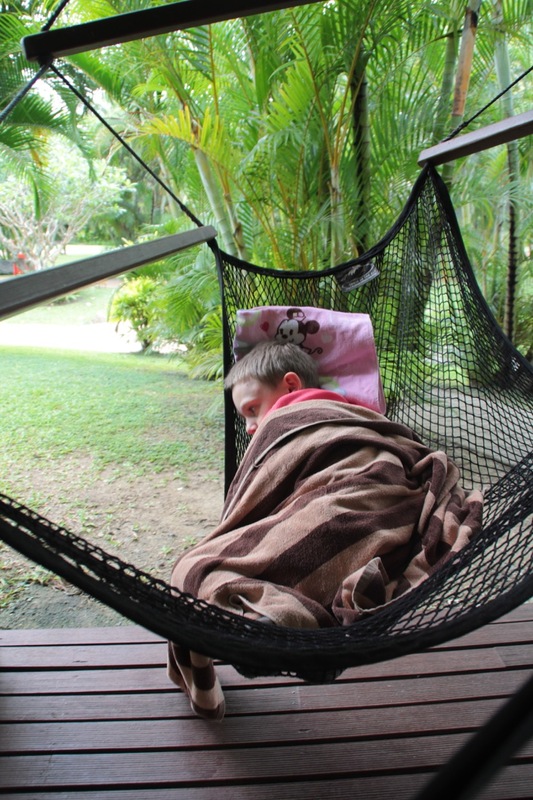 It was by and large a restful start to the morning on this the penultimate full day of our Fiji holiday. Although the kids were out of bed before us, they were content to follow Sandy’s direction to amuse themselves by playing with or watching movies on the iPads and iPhones. This gave us another half an hour or so and that was fine by me. It was after nine before we all managed to get up and ready to head out to main breakfast buffet. It’s fortunate that there are so many covered walkways meandering around the resort here, as today’s weather is overcast and inclement. Even with the light rain, it still feels tropical here, with warm temperatures quite a bit of humidity now. If anything, the rain has accentuated the lush foliage all over the place. Along our path towards the breakfast hall, we stopped at various streams and ponds to spot frogs, tadpoles and fish. One of the streams we past yesterday even sported some crabs half the size of my hand scurrying about. Breakfast was nice and the kids picked from the buffer as they saw fit. Sandy had the brilliant idea of taking some of the small pancakes away with us to ensure that the kids had something filling to eat at lunchtime. Getting the kids to eat anything substantial for lunch has been something of a challenge for us over the past several days. ￼Joey was a bit clingy when we dropped the kids off at kids club for this morning’s session but he soon settled down as usual. It’s often difficult to know just what he wants to do because he has a distinct tendency to shun whatever it is that you’ve asked him about - even if it’s something that he wants. Anyway, with the kids now off our hands for a couple of hours, we collected the laptop and made our way over to the main reception, where we knew that we would get Wi-Fi reception. Unfortunately, although Wi-Fi is supposed to be available everywhere, there are black-spots around the resort and our bure just happens to be one such place. So far, I’ve managed to locate a suitably strong signal in only a couple of places - at our usual spot by the pool or in main reception. We sat at reception long enough to upload a couple of day’s journal entries to our web-site and to sift few a few Facebook entries before I suggested to Sandy that we go down a couple of floors to sit on the oversized double loungers there. These are kind of like full-sized beds with comfortable cushions around 3 sides. I went down to procure one and Sandy came shortly thereafter. She re-opened the laptop to continue with the 1-hours session that we had just bought upstairs but, alas, not enough signal strength here either. This immediately put Sandy into a grumpy mood and she went upstairs to point out the fact that we have so limited Wi-Fi access. She came back shortly thereafter claiming that we would be ‘taken care of’. Not sure if that meant they would send the heavy boys around to measure us up for a pair of concrete boots or not. We’ll see. We spent a few more minutes enjoying what little slither of peace we had left before collecting the kids again for lunch. We have booked ourselves a couple of treats for the next couple of days here in Fiji. This afternoon, we are going to enjoy a joint spa session. Apparently, we are going to both bath in a twin hot tub of ‘milk’ or something. I’m not actually sure what this really means so it’ll be a surprise - a pleasant one I hope. After the that milk bath, we each have an hour massage of our choice side-by-side. The package is called ... something or other. It has cost me $515 Fijian Dollars so had better bloody well be worth it. This evening, we are also booked into the Sundowners restaurant again and for tomorrow, we have book the Sigatoga River Safari (for $715 Fijian Dollars), where we will apparently be whisked up the river along the valley in a speed boat to where we will have an encounter with an authentic Fijian village and to see what Fijian village life is like for the locals. This is one of those activities where I have to question the level of ‘authenticity’. Although I’m sure it’s a real Fijian village, I have to wonder what the effect is on that little corner of Fiji given that foreign tourists are ferreted up there daily to experience ‘authentic Fijian village life’. Mind you, since Fiji relies so much on tourism anyway, seeing a Fijian village making a living off of foreign tourists is probably authentic after all. ￼We met up with the kids, who were by now having their kids club lunch in the Vale Ni Kane restaurant. Whilst there, the kids continued with their lunch and we struck up a conversation with another parent with a special needs child. Like ours, his child doesn’t outwardly exude ‘special needs’ at all and you wouldn’t think him anything other than perfectly neuro-typical unless you were informed. His child apparently has ODD and we exchanged anecdotes about our children, their needs and what strategies we each have developed to cater for them. It was very interesting hearing all about ODD and what problems this other guy was dealing with. It never ceases to amaze me just how different each child is and how different problems require different strategies. It’s so disheartening at times to hear people generalise about what you as a parent ought to be doing for your child - especially when they haven’t the first clue about what your child is really like day-in and day-out. I don’t care who you are, unless you walk a mile in a parent with special needs child’s shoes, you cannot and should not offer advice or guidance - especially when it’s not solicited. The kids were all having a ball in the main buffet hall and one of the few waiters that were hanging around did a very good job of conning me into ordering an exotic cocktail laced with rum and a few other alcoholic ingredients. Well, the truth is that he really didn’t need to work very hard at convincing me. I wouldn’t normally drink such alcoholic cocktails - even if they were less than $28 Fijian Dollars each. I did take the opportunity whilst the kids were still having a good time to wander over to the laundry with a bag full of clothes that we needed washing. This required a detour to the main reception desk on the 8th floor of the main building, and also the general store on the floor below it, to pick up some washing power at $5 Fijian Dollars and a few laundry tokens at $4 Fijian Dollars each to work the machines. ￼We, and several other parents with their kids were slightly early at the kids club and so we mulled around a bit waiting for the staff to show up. So far as we’ve been able to tell, Joey hasn’t been spiteful towards any other children here at the resort over the past week but I did spot him [almost] hit another child in the kids club playground and this earned him a 10-minute time-out. Two steps forwards and one step back, as the saying goes. After a while, I nipped back to the laundry room again to move the laundry from the washer to the dryer and came back to kids club just as the staff had arrived and were getting things going. Joey was again very clingy and again required the assistance of the one the staff to separate from me, which he ultimately did. For a child that is so keen to spend so much time at the kids club, he is certainly very reluctant to be dropped off each time. It’s a constant dichotomy with Joey. With another brief rest-bite period for us, we rested for a little at the bure ahead of our spa treatment. Before getting the motorised buggy up the winding hill again to the Bebe Spa, Sandy spent a few minutes at the main reception desk trying to point out the problems we’ve had with our Wi-Fi access. I figured they would just give us a voucher to use to connect the next time but the underling on duty didn’t think he had enough seniority to offer this and suggested we come back later when the duty manager was present. ￼After a quick shower and now clad in the light-weight, white robes with the spas name embroidered on them, we rested for a few minutes back in the waiting room again before being led into our treatment room. Our sunken bath on the balcony was already prepared. It was near full with a white, milky-like liquid with several bright (and real) flowers floating on the surface and with just the right amount of bubble-bath foam. Next to the bath was a platter of sliced fruit sitting in a shallowed out half pineapple on a tray adorned with flowers. A couple of chocolate covered bananas and two glasses of bubbling champagne finished off the scene. Next to the sunken bath were a couple of chairs with bowls in front of them. On this side of the balcony’s glass dividing wall were two massage beds side-by-side all prepared and ready for our massages. We were invited to sit in the chairs on the balcony overlooking the ocean, where we would each get our foot cleaning and sugar salt exfoliation treatments. The two masseuses were making smalltalk with us as they cleaned our feet and applied the sugar salts. This lasted just a couple of minutes before they invited us to spend the next half an hour in the sunken bath before taking their leave to allow us to sit and relax in peace. The combination of warm, milky bathwater, delicious fruit platter, tasty champagne and spectacular views made for a rather relaxing half an hour that I could very easily have put up with for the rest of the day if forced to. All too soon, however, there was a knock at the door and this was our signal to get out of the bath tub and rinse off in very nice balcony shower. The shower was deliciously warm with a very good flow of water, which I really liked. We donned our robes to allow the two masseuses back in the room and, with a sheet having been raised for modesty, quickly removed them again to get into position on the tables. For the next hour, we were both massaged to within an inch of unconsciousness and it was absolutely bliss. I did my level best to make life for the masseuse easier by allowing my body to become limp by attempting to fall asleep - repeatedly apparently. ￼Unlike my previous spa treatment, the oils that were used this time had been pre-warmed and were nice and hot as they were applied this time around. The A/C had also been turned off ahead of time. These were two comments that I had made on my post treatment survey form from the previous treatment so it may be that those comments were actually read and acted upon for this time around. With our robes now back on again, we went back to the resting room and just sat there for a few minutes - basking in the post bliss of our spa experience. I finally found out that our treatment was called the Romantic Rediscovery. It definitely lived up to it’s namesake. After a while, we made our way back to the changing rooms, showered again, dressed and collected our things from the lockers in the changing rooms. Due to the persistent drizzle, our motorised buggy that took us back down the winding road to the main resort was now sporting an all-round plastic covering to keep the rain and wind at bay. ￼It wasn’t long after sitting at our table and making our way through our exceedingly tasty starters that Lana and Darren wandered in and sat at the bar. They, too, were without offspring in tow and so I went over to invite them to dine with us at our table, which I’m pleased to say they did. We had an absolutely lovely dinner and we recounted many of the things that had happened to each of us here at the resort over the past 5 days or so. The musical entertainment for the night was a solo guitarist playing western songs in a gentle Fijian style. He seemed to have laboured breathing after a while and had to go outside for some air. It wasn’t until we saw him puffing on an inhaler that it became clear that he had asthma but we were concerned enough to call over the restaurant manager to inquire as to his well being. He seemed fine eventually and continued with his musical set. We all finished a lovely meal with exquisitely lovely, waist expanding deserts and collectively made our way back over to the kids club to collect our respective sprogs. ￼We arrived just as they were about to start the ‘crab racing’ event, which turned out to be watching hermit crabs with numbered shells scurrying around on a round polystyrene board until the one that reached the edge first was declared the winner. Each of the kids had a number written on their hands and the child with the number that corresponded with the winning crab’s number had won themselves a free ice-cream voucher. I couldn’t help but to spare a brief thought for just how differently Fijian kids and Ozzie kids apparently entertained themselves. With the wet weather persistent, making our way back to the bure from the kids club turned into a frog-spotting event. We must have seen nearly a dozen on the short walk back to our bure. With everyone so tired, our bedtime routine was swift and ‘relatively’ painless tonight. I’ve just now finished writing my journal entry. Alas, having taken no photos at all today, any that I do decide to slip in will uncharacteristically be photos taken on previous days instead.